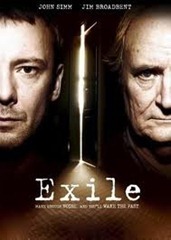 Over the weekend, I finished Exile, a three-part drama series from the BBC. I’d ordered the DVD from Amazon.co.uk never having heard of the production, but since it starred John Simm (I hugely enjoyed his performances in both Life on Mars and State of Play) and Jim Broadbent (think any number of TV productions or movies, he’s one of the top actors of his generation) I felt that I couldn’t go wrong. The basic plot goes like this: Tom Ronstadt (Simm) is fired as reporter/editor at a glossy news magazine in London – he’s taken to using recreational drugs to alleviate the fact he hates the job – and decides to return home, home being some unnamed town in Lancashire or Yorkshire. Problem is, he hasn’t kept in touch for 18 years after he left because of his brutal beating at his father’s hands. What will he find? It turns out that his father, Sam Ronstadt (Broadbent) has Alzheimer’s, and is cared for at home by his sister, Nancy (a nuanced performance by Olivia Coleman). Nancy is not at all happy that Tom had essentially deserted them – money’s running tight, Sam is succumbing faster and faster to the disease, and her life is slipping away. Soon after Tom arrives, she takes off for a few days’ vacation, leaving Tom to care for his father on his own. Tom is still haunted by the beating and tries to cajole Sam to reveal what led to it, the difficulty being that his father can only remember things and situations fitfully. Slowly Tom starts to piece together what Sam was investigating for his newspaper – like father, like son, he was a reporter too – and the cause of the vicious beating. As he blunders closer to the solution, he starts changing the lives of those around him: Nancy, Mike, his best friend from those days (brilliantly played by Shaun Dooley), Mandy, Mike’s wife (the gorgeous Claire Goose), and Metzler, the head of the local council (Timothy West). Simply put, this was a riveting drama. For a start, it explored without flinching what it is like looking after someone with Alzheimer’s. Tom is thrust into the role of sole carer with some hand-written notes from Nancy on hand that attempt to clear the way, but we are left in no doubt about how draining and sad this job would be. Sam has moments of clarity, even lucidity, but they are soon erased by sheer wackiness. For us viewers, these moments can be utterly hilarious (the scene where Tom first dresses Sam in the morning is a great example: Sam patiently undoes his shirt as Tom turns away to get his trousers), but there is always this sad horror in the back of your mind. As Tom says to him, “why couldn’t you have had something quick like a heart attack?” Alzheimer’s is anything but, just a slow distressing slide into nullity. Tom does not exactly start out as a hero in all this: he’s sniffing lines of coke, he has no idea what his father has become, he’s ignored (abandoned?) his only family for 18 years, he swans around in his Lotus (I’m not up on Lotuses these days, an Elise perhaps). He even beds the barmaid at the local pub, only to find out that she’s married to his old best friend. Nevertheless, the act of having to look after his father and to track down the mystery starts to effect a change in him and we get caught up in his attempts to elicit information from his father and those around him. Slowly, with frequent missteps, Tom pulls apart the curtains to reveal the truth; a truth he didn’t want, nor ever imagined. I was totally hooked for the three episodes. The design of the cinematography was exceptionally well done, the use of the northern landscape near Ramsbottom equally so (especially the wind farm seemingly always visible on the horizon, emphasizing the 21st century version of England’s mountains green), the script was pitch-perfect. Well worth picking up, I’d say.